Directions: Take I-40 to the James White Parkway and cross the river. Take the Sevier Ave/Hillwood Dr exit and turn left. At the end of Hillwood Dr turn right onto Island Home Ave. Take the 1st left to stay on Island Home Ave. Pass Ijams Nature Center on the left, cross the railroad tracks then take a left onto McClure Lane. Go approximately 0.5 miles and parking will be on the right. Directions: Take I-40 to the James White Parkway across the river. Take the Sevier Ave/Hillwood Dr exit and turn left. At the end of Hillwood Dr turn right onto Island Home Ave. Take the 1st left to stay on Island Home Ave which will become Island Home Pike. Go 2.5 miles and turn left onto Burnett Creek. Go 0.7 miles and turn left into the parking area (trail post marks entrance). Forks of the River Wildlife Management & Hunting Area is an active hunting ground that allows trail access for recreational activities. 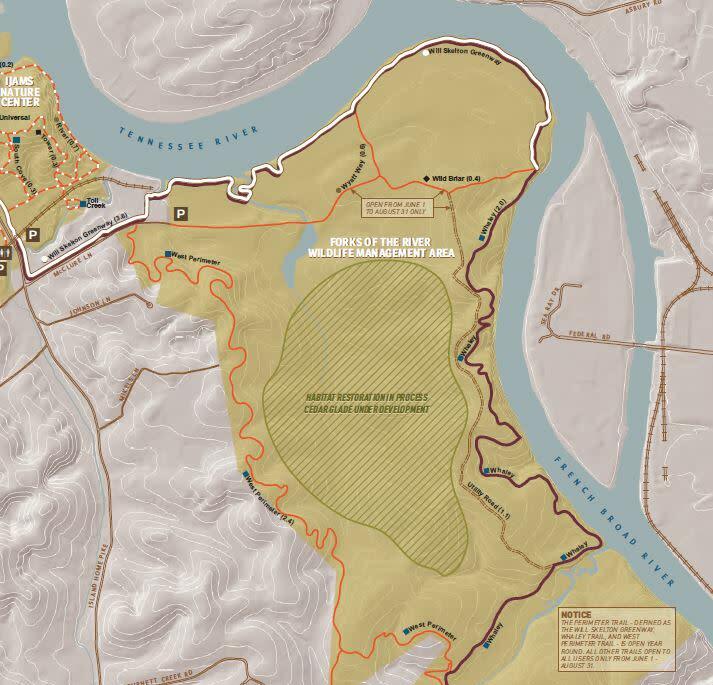 From Ijams Nature Center, the paved Will Skelton Greenway connects to Forks of the River and skirts the edge of the Tennessee River. From there, 6.5 miles of natural trails and dirt or gravel roads wind through fields and woods. The Whaley Trail follows the French Broad River before crossing Burnett Creek Road and connecting to the Anderson School Trails. The Perimeter Trail – defined as the Will Skelton Greenway, Whaley Trail and West perimeter trail - is open year round. All other trials, Utility Road, Wild Brier and Wyatt Way are open to users from June 1- August 31 only.